The second of course is Christmas... the time of year when Christians like me celebrate the birth of Jesus Christ, the new hope that the law and prophets spoke of in the Old Testament. I've been thinking a lot lately about what links these two very different events personally, in my own mind. I've found it very interesting and poignant that all through the promotional months we have seen precious little of the main protagonist of the original trilogy - Luke Skywalker. Fans have been getting very anxious about it, some are worried it means that Luke has turned to the dark side, others think he won't be in it much at all... still others have come up with the (crazy) idea that Adam Driver's character (Kylo Ren), is actually Luke and the casting of Driver is all part of some big conspiracy. I share the anxiety but not the fear. We've all become hung up on the question of "Where is Luke Skywalker"? You see therein lies the heart of the matter. As Christians we get so hung up about demanding "Where is Jesus?" in the festive celebrations... but that's defensive and about fearing what we care about will be ignored by others. True evangelism isn't driven by the fear of rejection... it's driven mutually by the love of the subject and the love of the uninformed audience. We actually need to move the question on. We need the question to be "Who is Jesus Christ?". "It's true. All of it. The Dark Side, the Jedi. They're real." "Kid, I've flown from one side of this galaxy to the other, and I've seen a lot of strange stuff, but I've never seen *anything* to make me believe that there's one all-powerful Force controlling everything. 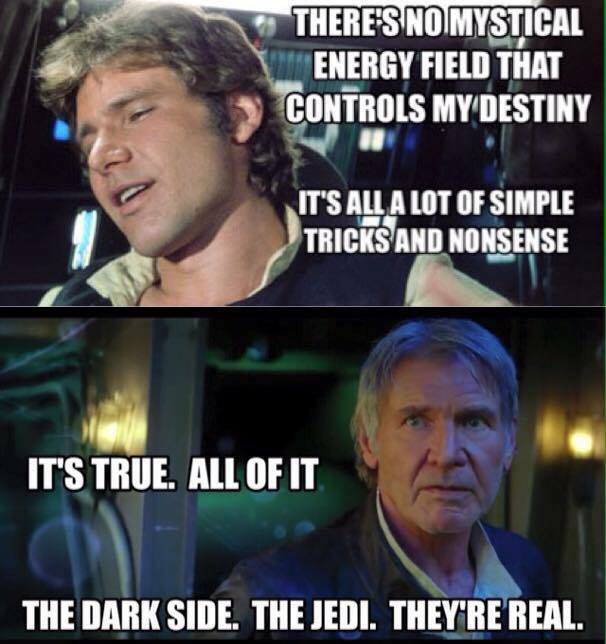 'Cause no mystical energy field controls *my* destiny. It's all a lot of simple tricks and nonsense." That's quite some turn around. 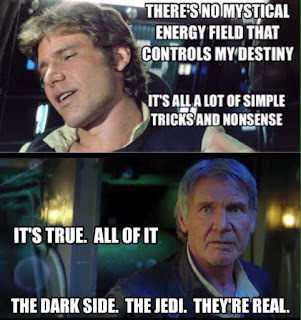 It may well be that Han's concept of the personal significance of the Force isn't much different, but for him to have come forward as a kind of reluctant evangelist and state "it's real", is immensely powerful. For the record, I'm not saying in any way that Jesus is a myth... I'm saying quite the opposite. I'm merely saying that if we want to stop people seeing Jesus as a myth, we need to move on from repeating stories to them that they already know (when they know them), and show the reality of Christ in how we live. Often people get hung up on dressing Christianity up, be it with the bells and smells of tradition or an explosive light show that would put even Michael Bay to shame; but actually if we took a step back we'd see the simplicity. It all boils down to conviction - a person or a group of people stepping forward and demonstrating with sincerity that it happened... that Jesus was, is and always shall be real and has had a tangible presence in their life. "It's true. All of it. The sinful nature, the Saviour. They're real." What excites or worries you most about the forthcoming Star Wars film? What excites or worries you about Christmas? Is Christmas true for you? All of it? Is it real?